Diane and I went on our first cruise way back in 1994. This cruise was to celebrate our 10th wedding anniversary. We cruised aboard Carnival Cruise Line's (CCL) MS Holiday. The Holiday is a 43,000 ton cruiser built in the mid 80's. 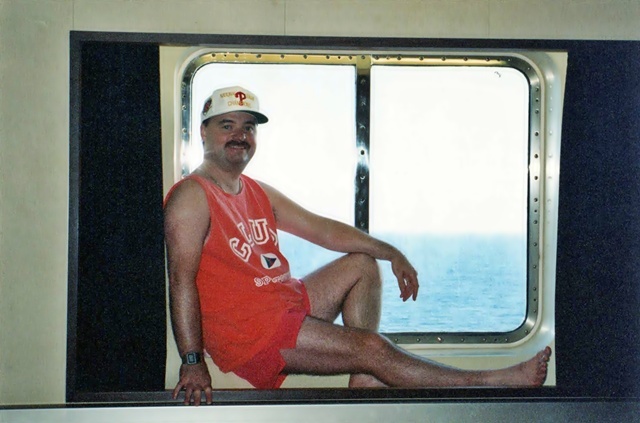 We were on a seven day cruise of the western Caribbean which took us from Miami to Cozumel (Mexico) to Grand Cayman to Jamaica and then back to Miami. Wow... no flat screen TV yet! 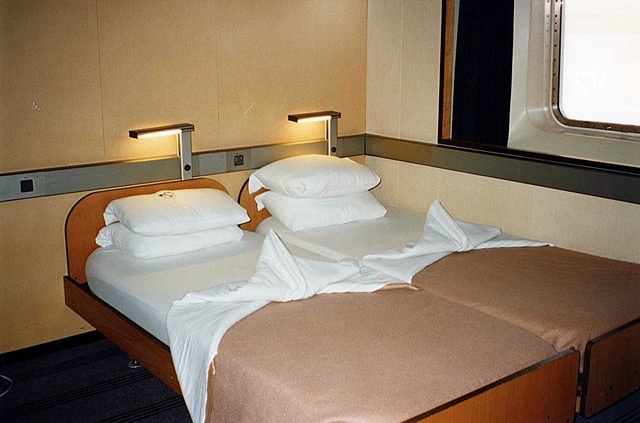 I still have fond memories of this cruise... you always remember your first cruise! There were great people sitting at our table- all mostly first time cruisers like ourselves. We kept in touch for years. 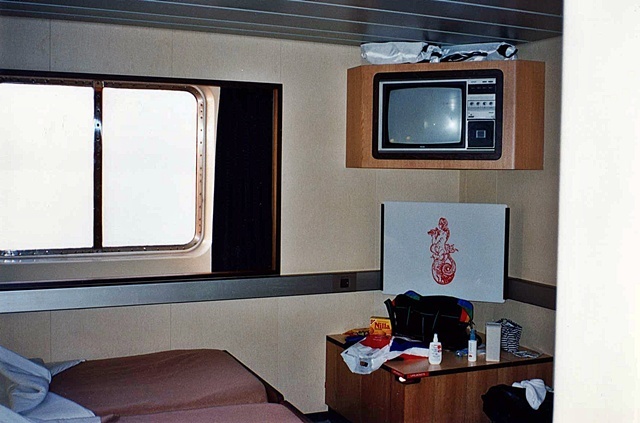 I remember the ship as being cozy (very small compared to what we've grown accustomed to now) and the food as being fantastic! (The desserts especially so...) Our waiter in the main dining room was very professional. The ports were fair (Cozumel) to spectacular (Seven Mile Beach, Grand Cayman). Opinions we still have today of those ports. In Cozumel, we toured the Mayan ruins at Tulum, one of the excursions from Playa Del Carmen. In Jamaica we climbed the falls at Ocho Rios (where I had an unfortunate accident with some medicine in my pocket that turned into yellow paint like goo! Changed my bathing suit from blue to green!) which was actually a lot of work. Fun to do once, but I wouldn't bother again. In Grand Cayman, we loved the beaches at Seven Mile beach! If you're a beach person, it's a must do! 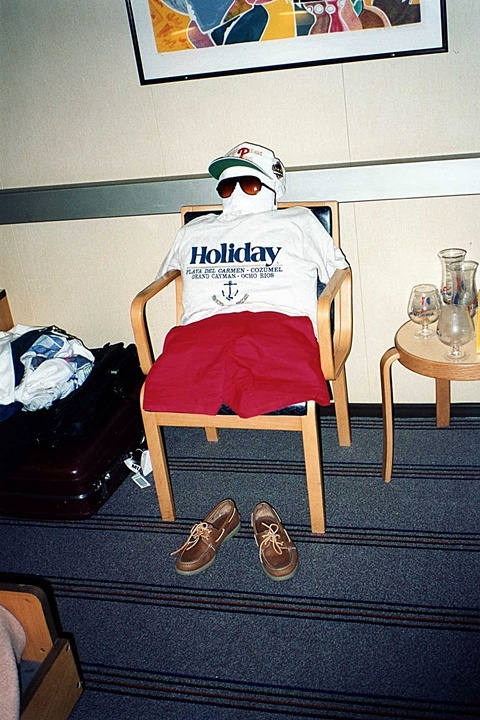 The cabin crew had some fun with some of the clothes I left laying around! I guess the art of towel animals hadn't gotten to Carnival yet! Hey, look- we're starting to collect "free" glasses! Me sitting in the window... where's my balcony?!? 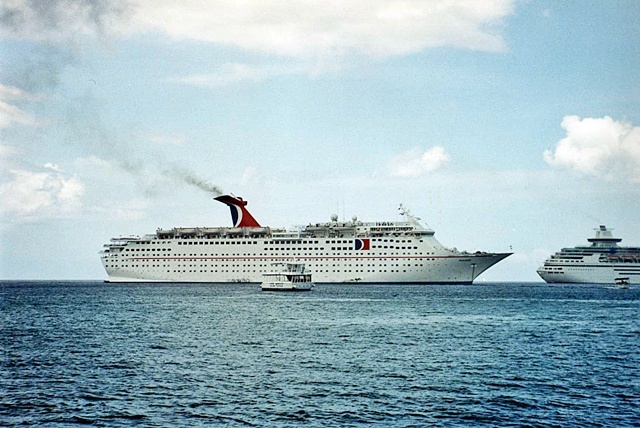 The MS Holiday's heyday is behind her, but in 2005 she played an important role in the disaster relief after hurricane Katrina when she served as a residence for some of the victims of that devastating storm (Bravo, Carnival!!!). She continues to do 5 night cruises out of Mobile, Alabama to the western Caribbean.